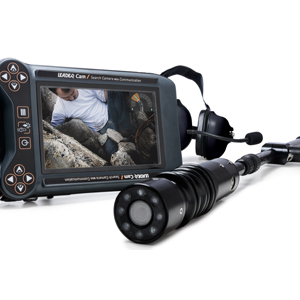 LEADER Cam, Search Camera with communication, is designed especially for visually locate buried victims, talk to them and evaluate their level of assistance. 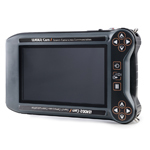 LEADER Cam Search Camera is used during technical rescue operations to locate and communicate with victims. It is designed to carry out precise visual location, by extending the ears and eyes into voids and it allows two-way communication with the victim once they are found thanks to the microphone / speaker placed on the camera head. Its new design more compact and lightweight allows a more efficient search. NEW control box lightweight (1.380 kg) and compact (W 9.61” x H 6.1” x D 1.93”) designed speciﬁcally for search application! Submersible up to 2 meters when in "waterproof mode". PTT function using the two way communication camera head to talk with buried victims. Leader Cam P2 - w/ communication camera - 2M (6.5ft) Probe + 1 batt + sun shade. Leader Cam P4 - w/ communication camera - 4M (13ft) Probe + 1 batt + sun shade. 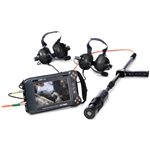 Leader Cam R90 - w/ 90M (295ft) cable on reel and communication camera + sun shade.